Do you think our federal government knows how much and where it is is spending money? That’s according to the Government Accountability Office, which identified more than two dozen new areas of inefficiency and overlap in its annual report to Congress. This is on top of the more than 160 redundant areas that the GAO has identified in its three previous reports. “It’s impossible to account for how much money is wasted through duplication, in part because the government doesn’t keep track of which programs each agency is responsible for,” Comptroller Gene Dodaro said prepared congressional testimony. Right now, there are 10 different agencies within the Department of Health and Human Services that are providing similar services relating to AIDS outreach in minority communities. There are also 11 different agencies performing autism research without properly coordinating their efforts. In another example included in the 200-page report, the auditors found that Colorado’s Schriever Air Force Base has eight different satellite control centers controlling 10 different satellite programs. Meanwhile, the report also identified a $4.2 billion loan program within the Department of Energy for Advanced Technology Vehicles Manufacturing that hasn’t been utilized since 2011. There is even a video to report waste, fraud and abuse, but no one seems to know how to solve those issues. Checking the House Oversight and Government Reform Committee website, there are no reports or menu of items they are investigating. Where is the confidence in that? Still not convinced spending is literally out of control? GAO’s 2016 report found that the Social Security Administration (SSA) has not fully addressed the growing amount of Disability Insurance overpayments. In FY 2014, SSA identified $1.3 billion in such payments, in part because Congress still allows individuals to collect both full Social Security Disability Insurance benefits and Unemployment Insurance at the same time. The Congressional Budget Office (CBO) estimates that eliminating this double-dipping would save $1.9 billion over the next 10 years. The Treasury department’s Earned Income Tax Credit program had $15.6 billion in improper payments and the Social Security Administration’s errant payments totaled $7.1 billion. The 2016 report also highlights a mounting problem of obsolete information technology (IT) systems in the federal government. For example, the Department of Homeland Security was supposed to integrate and modernize its 422 different human resources systems and applications in 2003. GAO found that “limited progress” has been made, and none of its many recommendations in this area have been addressed. The federal government spends more than $1 billion on mobile devices per year; however, “GAO found that among 15 selected agencies, only 5 had complete service and device inventories.” Therefore, most agencies are unable to know when taxpayer-funded devices are no longer needed or are being abused. The 2016 report also cites many other outlandish examples of government duplication run amok, one of the most obvious being the existence of two programs in two different agencies that are tasked with inspecting the same type of catfish. There are 45 programs in nine different agencies for employment for people with disabilities. The federal government operates more than 90 different programs to foster the construction of green buildings in the private sector. In FY 2014, unobligated balances, or the amount of money not spent by an agency or department, stood at $870 billion. So, it seems we have enough reasons to declare we don’t trust you, the government anymore right? Yes, but is anyone listening? Not so much. So, trotting over to the U.S. Treasury website you can find the Final Monthly Treasury Statement. The report includes the final budget results and details a deficit of $666 billion for Fiscal Year 2017. Fascinating number eh? The issue is only 36 pages and it is suggested you begin at Table 3 and mobilize a team of friends where collectively you can perhaps define the line items, the duplicate programs or worse why they exist at all. There is an app for that at least at the state level for only a handful of states. Yeah for California, right? 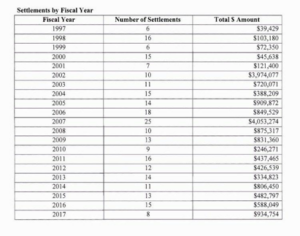 All of these cases were brought to auditors’ attention by tipsters using hotlines or fraud apps, which allow smartphone users to anonymously report government waste, fraud and abuse. Cities and states have long had hotlines for reporting misuse of government resources. But mobile apps bring a new level of sophistication. They allow people to submit photos and videos in support of their claims; and in some cases auditors can use the app to respond and ask for follow-up information, all while maintaining a tipster’s anonymity. Sixty-four percent of American adults now carry a smartphone, according to a report from the Pew Research Center. (The Pew Charitable Trusts funds both the Pew Research Center and Stateline.) Because reporting waste, fraud and abuse through an app is so easy, people are more inclined to do so, auditors say. “Smartphones are becoming a ubiquitous tool, and I think we need to meet people where they are,” said Dave Yost, the state auditor who in 2014 introduced a fraud app in Ohio. The cost of developing the apps varies. Ohio was able to develop its app in-house, while Richmond spent about $10,000 for outside help. Pittsburgh’s app was unveiled this month. It cost $20,000 to develop and will cost $3,000 for upkeep, but it also allows users to access a range of databases on city contracts and campaign contributions. In many places, it’s hard to discern how much of a difference the apps are making compared to traditional hotlines because auditors don’t keep track of where tips originate. Many of the apps allow users to call a fraud hotline from the app. So far, relatively few citizens have downloaded the apps. In Long Beach there have only been 160 downloads. In Ohio there have been 673. In Philadelphia, which in 2011 developed one of the first fraud apps, there have been 2,015 downloads. Whether tips are received through a hotline or an app, governments have received valuable information. This is an important exercise for every American paying taxes and the challenge is to question your senator or representative. If that fails, try contacting the House Oversight Committee and ask some hard questions, in fact make some demands. Those dollars reported by Treasury, those dollars in payouts and those dollars in waste, fraud and abuse are yours….you need to take ownership all while we are watching congress playing in the tax reform sandbox.